We occasionally have people who are interested in the history of our cemetery. It is not an unusual sight to see someone strolling through the head stones to find an ancestor. 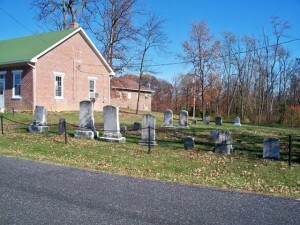 You may CLICK HERE (external link) to see a list of the gravestones in our cemetery, some of which date as early as 1855 (one of the pair of rounded stones in the center of the picture).